Happy summer babes! 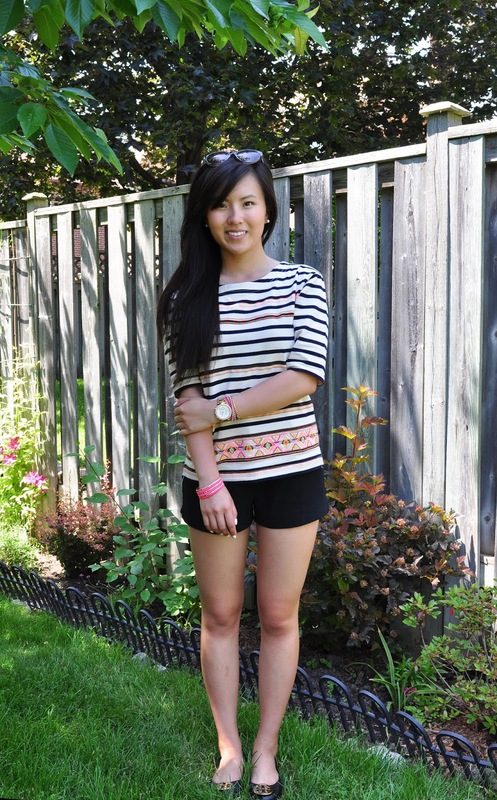 In honour of patio lunches and Starbucks runs, here's an easy outfit idea for all your day-time errands. I'm a huge fan of neon all year round but it can be a little too overwhelming on a day-to-day basis. A great way to subtly incorporate the trend into your outfit, is by adding bright details to a monochromatic colour scheme. Don't get me wrong, most days I still feel like dressing up as a highlighter. But in this case, simplicity is key. I'm obsessed with the straight silhouette and neon embroidery on this top. So I went with a pair of plain black shorts to bring out the details. It's a simple outfit that's quick and easy for daytime. Just stack on the arm candy and it pulls the whole look together. As for shoes, I went with my classic reva flats for a dressier look. They literally go with anything and everything, but do take a while to break in. My feet cried for weeks. This about sums it up. Hope you all have an amazing start to summer! Your followers should have seen you in person. The photographs don't do this outfit justice.